THE VATICAN’S FEMINISM – For the first time in History a woman was designated as head of one of the ten Pontifical Academies of the Holy See. On March 9, John Paul II named Mary Ann Glendon to be the president of the Pontifical Academy of Social Sciences. Glendon is a professor at Harvard University and was the Vatican representative to the 1995 United Nations conference on women in Beijing (America, March 22, 2004). On March 6, John Paul II also named for the first time in its existence two women to the International Theological Commission, an organ of the Congregation for the Doctrine of Faith. They were an American, Sr. Sara Butler teacher of theology at the New York’s St. Joseph Seminary, and a German, Barbara Hallensleben, teacher of theology at Fribourg, Switzerland (ibid.). It is another significant effort to destroy the characteristic of male authority in the Church, which indirectly sabotages the male priesthood as well. It was not by coincidence that these nominations were made close to March 8, declared the International Women’s Day by the United Nations. A constant policy of JPII’s pontificate has been to follow UN initiatives, giving the impression that the Catholic Church is inspired by and subordinate to it. More overtones of the progressivist agenda of this Pope. RAHNER: HETERODOXY APPROVED AS ORTHODOXY – The days of Pius XII’s Encyclical Humani generis (1950), which attacked Progressivism, seem lost. Indeed, that encyclical was a highlight of a decade of strong fight by the Vatican against the Nouvelle Theologie in France, Germany and other countries. That battle went as far as to condemn the principal thinkers of the movement, such as Frs. Henri de Lubac, Pierre Teilhard de Chardin, Yves Congar, Marie-Dominique Chenu in France, Frs. 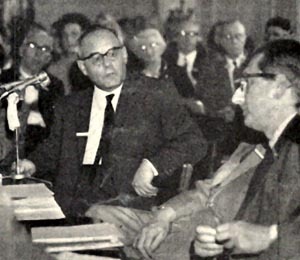 Karl Rahner and Joseph Ratzinger in Germany, and also Frs. Hans Urs von Balthasar and Hans Kung in Switzerland. All of these exponents of the New Theology were considered “suspicious of heresy” by the Holy Office, and some of their works forbidden (1). Later, some of them, such as De Lubac, Congar, Ratzinger, and Von Balthazar were made Cardinals and greatly praised by the conciliar Popes. Rahner, although eulogized and followed, was not made Cardinal, probably because he died in 1984 and also because some of his controversial theological theories were not unanimously accepted. Now it seems that any serious opposition to him and his theology has ceased inside the Holy See. To commemorate what would have been Rahner’s 100th birthday (March 4, 1904), an international conference on his anthropology took place at the Lateran University in Rome on March 4-5. Among others, Cardinal Crescenzio Sepe, prefect of the Congregation for the Evangelization of Peoples, Archbishop Angelo Amato, secretary of the Congregation for the Doctrine of the Faith, and Bishop Rino Fisichella, rector of the Lateran University were present. During the course of the conference, the Prelates endorsed the theories of Rahner as orthodox. 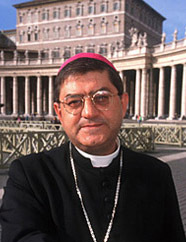 Archbishop Amato, for instance, approved him outright. After his talk he sustained: “Notwithstanding some ambiguous formulae, Rahner was an orthodox Catholic theologian.” American Jesuit Fr. John McDermont, also present, added: “He was Catholic down to his toes. The problem is not with his thought, but how is has been interpreted” (National Catholic Reporter, March 19, 2004). These acts are indisputably a glorification of Karl Rahner, one of the principal progressivist architects of Vatican II. Tempora mutandur… [the times change]. Today the Conciliar Church considers orthodox precisely the opposite of what the Catholic Church taught through the centuries. If a person maintains an attitude of love toward his neighbor, this act already comes from the will of God, who divinizes everything, even beyond the limits of the Church …. It is really, even if not expressly, a true act of charity and love of God” (2). No philosophy exists that can be simply a-Christian” (5). “Today the Church should not consider herself the sole depositary of salvation …. nor should she consider herself the only religious society in whose ambit one can find those who achieve salvation. … The Church should not be seen as a society of those who possess grace as opposed to those who are deprived of it. She must be seen as a society on the way to recognizing that …. she will become more herself as she accepts others who now only implicitly possess the grace of salvation” (6). He goes further and denies even the Creed. Well, here you have some samples of the thinking of the man whose centenary of birth the Lateran University commemorated early this month with the official endorsement of the Vatican. If these theses are orthodox, then the teaching of the Magisterium previous to Vatican II affirming precisely the opposite were wrong, which they were not. In summary we have heterodoxy been praised as orthodoxy. One more confusing message coming from the Vatican, whose mission is to teach the truth without ambiguity. 1. To know the different punishments they received, see my book Animus Delendi I, (TIA: Los Angeles, 2000), Introduction, note 15. To see how these theologians were promoted by John XXIII, Paul VI and John Paul II, see the same book, Introduction note 14; Chap. III, note 7. 2. K. Rahner, A graça divina em abismos humanos (São Paulo: Herder, 1968), p. 123. 4. 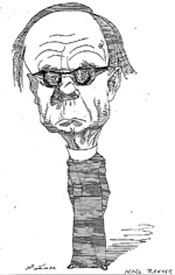 K. Rahner, O dogma repensado (São Paulo: Paulinas, 1971), p. 18. 6. K. Rahner, “Religione assoluta?,” in Incontro tra le religione (Verona: Modatori, 1969), pp. 104-5. 7. K. Rahner, “Sobre el problema de la evolución del dogma,” Escritos de Teología, (Madrid: Taurus, 1968), vol. 1, p. 53. 8. K. Rahner, apud Nicholas Lash, “Teologia al servizio di una commune tradizione,” Concilium, January 1984, p. 154.